Exhibition schedule: The Jewish Museum, New York City, May 1, 2015–September 27, 2015; Nova Southeastern University Museum of Art, Fort Lauderdale, FL, October 24, 2015–January 10, 2016; The Addison Gallery of American Art, Andover, MA, April 9, 2016–July 31, 2016; Center for Art, Design, and Visual Culture, University of Maryland, Baltimore County, October 20, 2016–January 8, 2017; The Smart Museum of Art, The University of Chicago, February 16, 2017–June 11, 2017. Television became the dominant entertainment and informational medium in the United States between the late 1940s and the early 1970s, introducing a radical change in American visual culture. In Revolution of the Eye: Modern Art and the Birth of American Television, published in conjunction with the exhibition at the Jewish Museum, New York (May 1-September 27, 2015), author and exhibition curator Maurice Berger traces the convergence of modern art and television, claiming that modern art was a significant inspiration for television and vice versa, and that the relationship between art and television was “symbiotic,” during those decades. 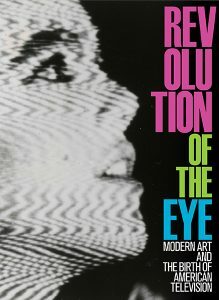 Case in point, Revolution of the Eye takes its title directly from a 1957 episode of Odyssey, Columbia Broadcasting System’s cultural affairs program co-produced by the network and the Museum of Modern Art. Odyssey explored “how modern art has profoundly changed the way people see and understand the world,” and Berger places equal emphasis on television’s role in such an epistemological turn (133). Television not only disseminated modern art and its formal language to a national audience, it also “helped inspire original vanguard art in its own right” in later years (6). Art and television’s symbiotic relationship, according to Berger, has not received enough attention from art historians and curators. Art historical and curatorial practices, more often than not, have overlooked art and television’s mutual influences, by treating “fine art as the privileged discipline, and have omitted “the question of how mass media, especially television, acted as a vehicle for the wide-scale dissemination of modern visual forms” (6). Revolution of the Eye fills those gaps with copious examples that illustrate common ground between modern art and television in midcentury America. Revolution of the Eye is constituted largely of two parts: a seven-section analytical essay, and a cultural timeline, with an introduction by media historian Lynn Spigel, whose pioneering scholarly work investigates the relationship between network television and Postwar American art. Berger incorporates Spigel’s insight throughout the catalog, drawing from her book TV by Design: Modern Art and the Rise of Network Television (Chicago, University of Chicago Press, 2009). Spigel’s introduction illustrates commercial television’s major role in integrating art into Postwar American life, by examining how “TV typically presented art through the language of family values and popular entertainment” (XII). Museums such as the Museum of Modern Art in New York and the San Francisco Museum of Art also sought ways to reach out to television audiences, and part of their endeavor involved making art entertaining. Television not only showcased art, Spigel argues, but was an art medium in itself. Artists and designers experimented with new visual forms and techniques through networks’ various design projects and productions. Yet, “television’s commercial imperatives often mitigated the more radical potential of modern art” (XIV). Television’s negative aspects became apparent by the 1960s, as the Federal Communications Commission chairman Newton N. Minow referred the medium a “vast wasteland” in his 1961 speech. Spigel, however, asserts that television still offered room for alternative views to intervene in network programs, which were “symptomatic of the period’s racial exclusions and gender ideologies” (XIV). In the following essay, Berger presents rich visual material and interesting formal comparisons to illustrate the kinship between art and television, making Revolution of the Eye accessible to a wide readership. The cultural timeline accompanies short texts explaining artistic movements, such as Abstract Expressionism, Pop Art, Fluxus, and Minimalism, so that readers with varying degrees of art historical knowledge can better understand the discussions throughout the book. The first section examines the intersection of American television and modern art in the 1950s and 1960s. Then a youthful medium, television was open to experimentation by producers, writers, designers, and entertainers. Pioneers in early television considered modern art “the epitome of cultural experimentation and creativity, [and] a model for shaping a brash new medium” (5). Berger uses Color Me Barbra, a 1966 CBS musical special featuring superstar Barbra Streisand, to explore television’s enthusiasm for art. Filmed in the Philadelphia Museum of Art’s modern art galleries, Streisand performs as a muse yearning for freedom and self-expression. Berger asserts that Streisand, in her Op Art dress and geometric earrings, transported herself into the world of avant-garde art, while assuming the sitter in Amedeo Modigliani’s Portrait of a Polish Woman (1919). Stating that these scenes represent the convergence of art and television, Berger notes that early television’s pioneers were aware not only of the medium’s aesthetic possibilities, but also of its nationwide impact on public opinions of social and political issues. Rod Serling’s The Twilight Zone and Ernie Kovacs’s eponymous show, for example, reflected the producers’ political consciousness, while adapting strategies of avant-garde art. Though early television’s appropriation of modern art was often cursory, Berger states, television’s modernist aspirations paralleled modern art’s aesthetic and conceptual dynamism, and the former’s techniques such as “fragmentation, appropriation, nostalgia, pastiche, and irony” inspired artistic practices that have come to be described as postmodern (9). In the second section “The Twilight Zone: Surrealism for the Masses,” Berger addresses The Twilight Zone (1959-1964), Rod Serling’s critically acclaimed CBS series. Probing how “Surrealist art and ideas provided Serling with a conceptual and aesthetic framework for exploring a range of philosophical matters” in the series, the author places Marcel Duchamp’s Rotoreliefs (Optical Disks) (1935/1953) alongside a still image of a whirling vortex from The Twilight Zone (14). He makes another compelling formal comparison, based on the image of a door leading to the unknown, between René Magritte’s The Victory (1939) and a still from the show’s title sequence. The Twilight Zone displays Surrealist art motifs, such as the whirling vortex and the door. It also explored the space between the conscious and the unconscious, a subject matter central to Surrealism. Serling’s treatment of the middle ground between two opposites was a commentary on a time of social and cultural change. For example, one of the show’s 1960 episodes, “The Monsters Are Due on Maple Street,” addressed “xenophobia, McCarthyism and the herd mentality of the Cold War” (22). In addition, Berger suggests that The Twilight Zone promoted individualism in response to the nation’s Cold War hysteria, and he grounds the TV show in 1950 and 1960s’ cultural history by likening its “psychological and existential themes” to New York School artists’ focus on “subjectivity, psychology, and the ethics of the self” (25). The Twilight Zone’s non-conformist aesthetic could be discussed further in terms of U.S. cultural politics during the Cold War period, when individualism and pluralism were upheld as democratic ideals against communism. Additionally, if the TV series were “a Surrealism for, and about, the masses,” as Berger writes, this essay could benefit from examining network television’s take on avant-garde imagery and sentiment—“the sense of skepticism” and “irony” (25). Such accounts would help readers understand how art and television’s symbiosis can be considered a “revolution,” or at least revolutionary. The third essay, “CBS: The Modernist Television Network,” explores how CBS adopted the language of modern art and design to present itself as a sophisticated and respectable cultural institution, using examples ranging from Eero Saarinen’s design of the corporate headquarters architecture to Ben Shahn’s print advertisements for the network. Berger also discusses the political dimension of CBS art director William Golden’s creative and administrative practices, exemplified by his hiring of the politically minded Ben Shahn. Through Golden, Berger touches upon how the CBS design campaign might have also been a socially conscious project. Golden’s design aesthetic was nevertheless compatible with corporate interests, for he believed that effectively promoting the network to the viewer took precedence over an individual designer’s self-expression. The next section, “Preaching the Gospel: Modernism on Television,” demonstrates how networks engaged modern art in various ways, from studio set design to programming, in order to counter the public’s negative view of television in the 1950s and 1960s. By doing so, television emerged as a powerful medium for exhibiting and discussing art. Art critic Aline Saarinen’s projects for NBC’s Today and Sunday shows, for example, helped to demystify modern art for television audiences, while other network programs featured artists such as Marcel Duchamp, Alan Kaprow, Roy Lichtenstein, Georgia O’Keeffe, and Andy Warhol. Network television was, however, by no means an uncritical disciple of high art. Berger illustrates network television’s complex relationship with modern art through the example of a 1967 Batman episode “Pop Goes Joker.” The show appropriated Pop Art’s “hip” visual forms and ideas for its own sake, and yet it satirized the art world’s elitism. Berger also points out the similarities between The Ed Sullivan Show’s set designs and Color Field painting, Pop Art, Op Art, and Minimalism, showing how network television borrowed formal language and techniques from the art world to shape visual styles on a TV set. Drawing from art historical discourses on minimalist sculpture and the viewer’s phenomenological experience in actual space, Berger states that “these sets rooted … [the viewer] … in a fresh, energetic present, and accentuated the variety format’s unique dependence on live performance or transmission” (73). This section also examines modern art’s influence on television commercials, focusing on Saul Bass’s 1962 project for Mennen Baby Magic lotion. In the fifth section, “Ernie Kovacs’s ‘Postmodern’ Performances,” Berger examines how Kovacs challenged ingrained ideas of television with his appropriation of avant-garde film’s audio and visual techniques, and how this practice alluded to postmodern aesthetics. Television was, for Kovacs, a “neutral site” for formal experimentation with audio and visual elements. Berger applies Walter Benjamin’s ideas of contemplation and distraction—as modes of experiencing painting and film respectively—to his interpretation of Kovacs’s work. In this sense, Kovacs’s experimental work resembles avant-garde film, going beyond mere formalism. Berger asserts that Kovacs prefigured “the quintessentially postmodern sensibility of television,” especially video art (85). The sixth section “The Museum of Modern Art Television Project (1952-1955)” focuses on the museum’s efforts in the 1950s to enlighten the national audience, especially females, about modern art through television. MoMA hoped to expand modernist culture beyond the museum walls, yet its perception of television was at best ambivalent and inconsistent. Berger reveals the complex nature of the project, by examining the clashing opinions inside MoMA regarding the museum’s engagement with mass culture. In doing so, he traces how MoMA categorized television differently between the early 1950s and late 1960s—first as a communication tool, and later as part of its archives. Berger mentions that the museum’s television project did not target a male viewing audience, yet its collection was primarily comprised of works by male artists at the time. MoMA’s ambivalence toward the project, which catered to female viewers, could be examined further in relation to the museum’s active promotion of Abstract Expressionist painting around the same time. MoMA’s conception of two different audiences—male cultural elites and female television viewers—and their correspondingly gendered programming could be addressed as an example of the institution’s prioritization of art over television. This section concludes that The Museum of Modern Art Television Project is yet another example of the symbiosis between art and television. Despite MoMA’s reservations about embracing television, the project challenged the dichotomy of art and television as the epitome of high and low culture respectively. In his “Epilogue: Television and Modernity,” Berger takes up the increasingly complicated relationship between art and television in the 1960s and 1970s, when artists such as Andy Warhol actively incorporated television into their artistic practice, and others began experimenting with video. Such complexity, however, does not simply mean more diversity in artistic media and forms; it also means an increased immediacy between the cultural domain and other realms of society. Berger tacitly makes this point through Warhol, whose presence introduced national audiences to alternative views on cultural issues such as homosexuality, at a time when mass media was rife with homophobia. Revolution of the Eye weaves together various cultural practices, both on the individual and institutional level, making the case that television was not just a “vast wasteland.” Berger meticulously examines modern art and television’s mutual influences, and by doing so, adds his book to a list of essential texts devoted to the intersection of art and network television, such as David Joselit’s seminal book Feedback: Television Against Democracy (Cambridge, MIT Press, 2007). The revolution of the eye in the 1950s and 1960s was contemporaneous with radical social change, epitomized by the Civil Rights Movement and the Counterculture. The book’s subject time period overlaps with the Vietnam War, considered the first war to be televised, thus inseparable part of television history. Drawing from Berger’s examination of the kinship between modern art and network television, future scholarship could produce more diverse interpretations of how this unique symbiosis functioned in a larger historical context. About the Author(s): Hayan Kim is a doctoral candidate in the Department of Art History at the University of Illinois at Urbana-Champaign.